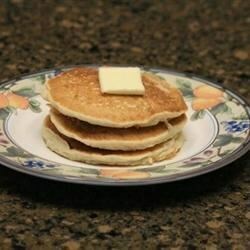 "This pancake recipe was created for my family members with multiple food allergies. This tasty breakfast item uses applesauce instead of egg and rice instead of wheat. A moist and yummy option for those with limited food choices. Serve with your favorite topping." Combine the rice, milk, rice flour, sugar, applesauce, baking powder, and oil together in a bowl; blend with an electric hand mixer for 2 minutes. Grease a large skillet or griddle and place over medium heat. Pour 1/4 cup of the batter onto the griddle; cook until the underside is golden brown. Flip and cook until the other side is also golden brown, 2 to 3 minutes per side. Can't wait to try these. I have celiac disease and grandson has egg/dairy allergies. This has us both covered. Thanks ! I am sorry but just did not work out for me. The batter was a lot and it thickened up substantially.